And then near the end of the introduction, he makes this statement – May God gives us the courage to make the changes necessary to give new life to our churches. At the end of every chapter in this book is a reflective, prayerful commitment that Rainier challenges the reader to pray. I like this book but it is very direct. The author pulls no punches but at the same time ends with some advice at the end of the book. Although it is a scant read (102 pages), it presents some very straight forward findings from churches that have actually closed their doors never to open again. May we all learn from these facts. Sounds interesting. 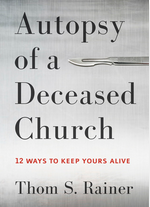 Are you going to share any church-killers from the autopsies?